The 1985 JCPenney Christmas Catalog. | Dinosaur Dracula! Oof. 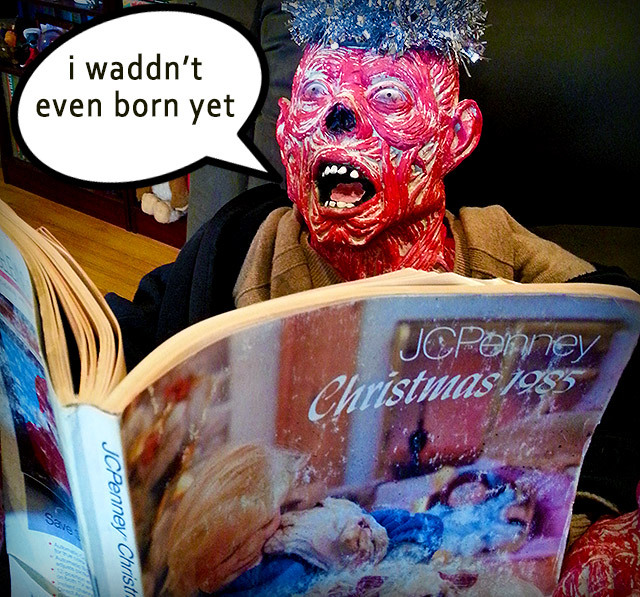 Christmas caught me by surprise this year, and I didn’t write nearly as often as I would’ve liked to. Can’t do anything about that now, so I’ll just try to make this an extra good one! Today we’re gonna look at some highlights from the 1985 JCPenney catalog, which was basically another Sears Wish Book, serving as a veritable bible of that year’s hottest toys and games. I actually covered this exact same catalog way back in 2007, but it seemed criminal to stop at a mere twelve items when the book had hundreds of things worth celebrating. 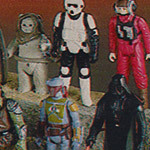 1985 was an absolute banner year for toys, as I think these seven selections will prove! 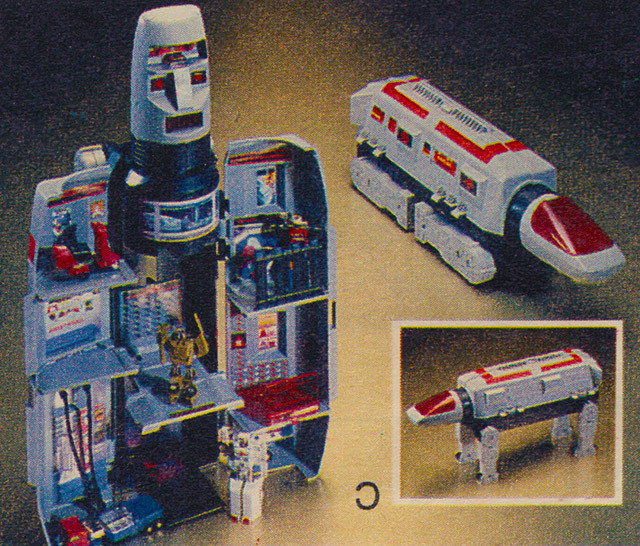 Gobots “Mobile Command Center” Playset! Remember the AT-AT from Star Wars? This was like the its rad kid sister. The Mobile Command Center was easily the crown jewel of Tonka’s Gobots collection. Starting off as a four-legged transport not unlike those behemoths from The Empire Strikes Back, the playset then transforms into a multi-level headquarters that doubles as a giant robot. TOO COOL, and not in the Brian Christopher way. I’d like to say that I used the Mobile Command Center for that purpose, putting Darth Vader in charge of a futuristic apartment complex with a loft shaped like a robot head. The truth is, I never had one as a kid. A friend of mine did, and I was so jealous. He was one of those friends that I only had scattered after-school play-dates with, while our mothers forced awkward conversation over cups of bad coffee. That guy had everything. His bedroom looked like Toy Fair. Through him, I saw enough of the Mobile Command Center to know that I was seriously deprived. This as close as we’ve ever come to the fictitious skyscraper robot from Big. Popoids were kinda marketed as mutant LEGO sets, so it’s only fitting that this special batch came packaged in a very LEGO-like bucket. I totally had this bucket, and it was wonderful. Sets included mix-and-match pieces of what I guess we’d term “robo-alien body parts,” along with oodles of collapsible “pipes” to bind them together. These pipes could be twisted into any reasonable position, serving as everything from necks to legs to arms to tails. 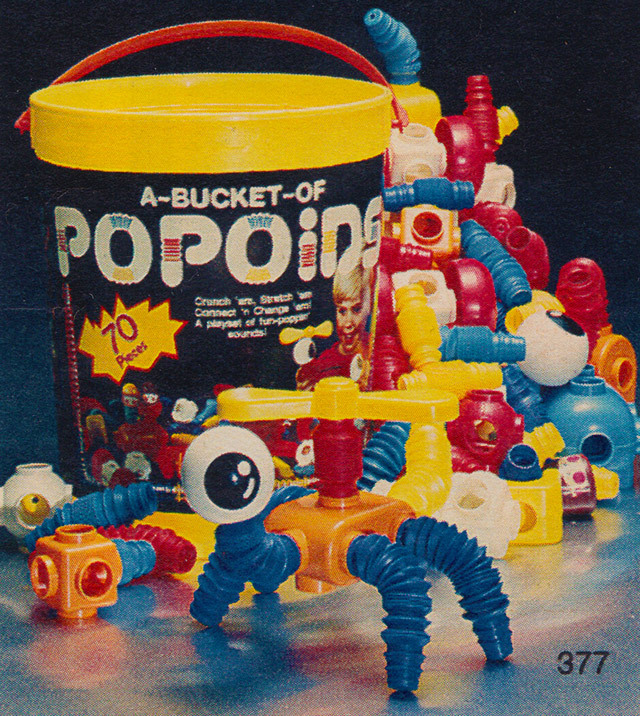 PS: If you only have the faintest memories of Popoids, it’s probably because you had the small giveaway versions from an ancient McDonald’s Happy Meal. 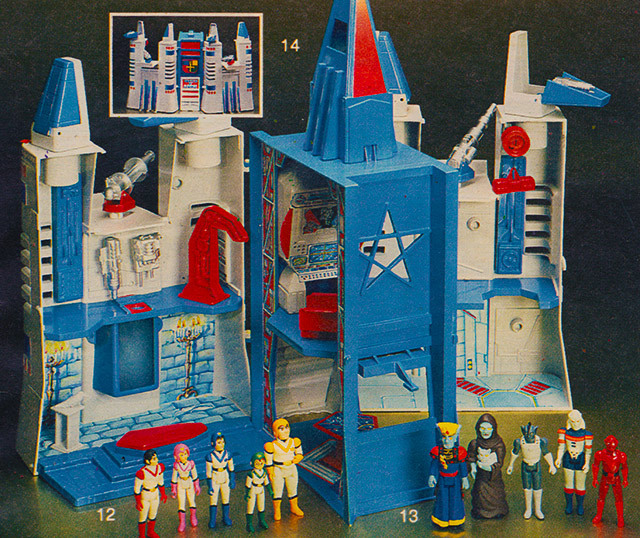 Voltron “Castle of Lions” Playset! The Castle of Lions playset was the priciest piece of that splinter group, worth every penny of its sixty dollar price. 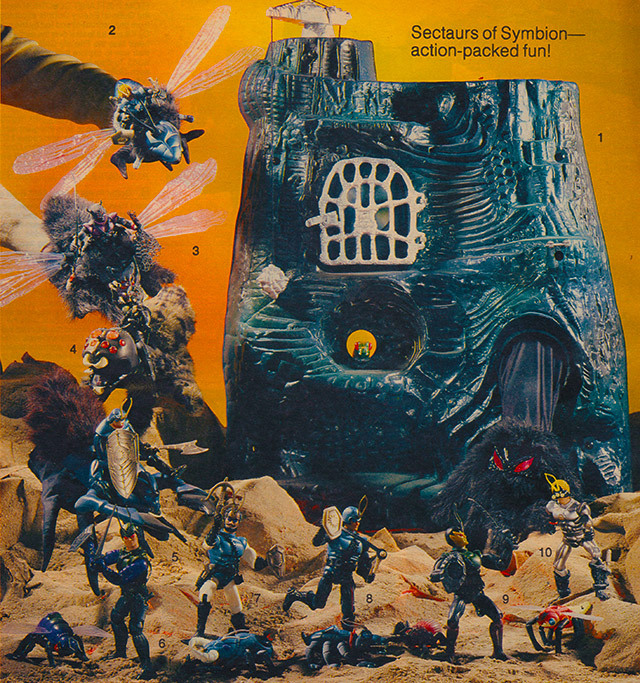 While certainly resembling the same-named headquarters from the animated series, the playset seemed more like an ice cream parlor expanded into a medieval castle. 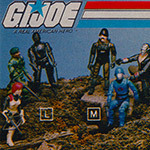 Just looking at that one photo makes me remember how easy it was to completely lose myself in the right action figure playset. How I’d meticulously arrange my figures inside, and how I never knew which were my favorites until it was time to fill the best locations. It’s too bad that I’m only halfway done with this article. All I wanna do now is lay on the floor with Castle Grayskull. G.I. Joe Crimson Guard Commanders! …better known as Tomax and Xamot, the slick Cobra brothers who finished each other’s sentences and gave millions of kids exaggerated ideas about twin bonds. They were some of the coolest characters from the cartoon series, gleefully evil and yet somehow indifferent to their purported cause. It seemed to me that Tomax and Xamot were only bad guys because things were more fun that way, and were aligned with Cobra not so much for its tenets as its fashion. 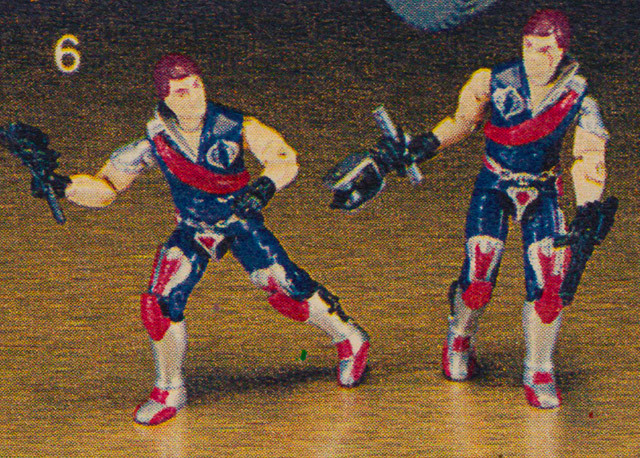 The twins were sold together in a special two-pack, with only Xamot’s facial scar to help differentiate them. They’re affordable enough loose, but don’t bother looking for a packaged set, which can cost as much as a thousand bucks today. 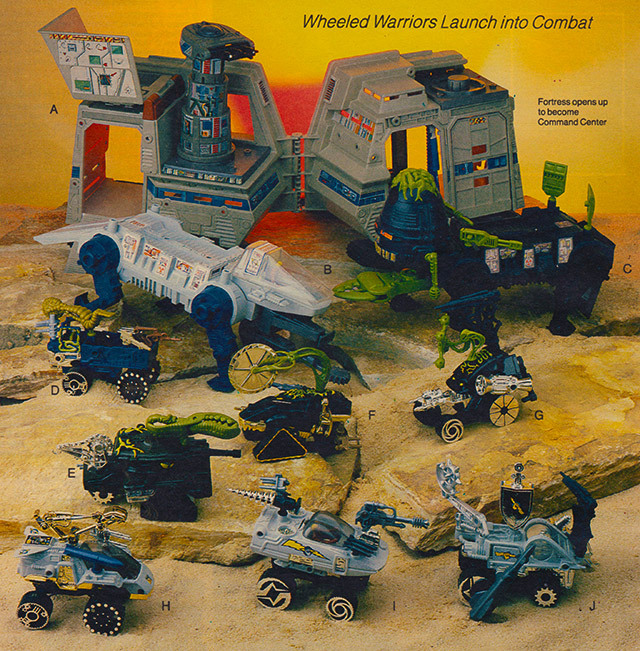 For all the many topics I’ve mined too many times, it’s criminal that I’ve written so little about Wheeled Warriors, one of the most unique of all ‘80s toy lines. The heroic Lightning League vehicles came with little plastic people to drive them, while the evil Monster Minds came with small, squishy green “brains” to act as their techno-organic souls. Moving up a size were two battery-operated beasts, Trail Blazer and Beast Walker, which were as cumbersome as they look in the photo. If you had cash to spare, you could also pick up the $40 Battle Base, which was roomy enough to fit four vehicles. …and speaking of lines that I haven’t given nearly enough Dino Drac love to, heeeere’s Sectaurs! In summary, these were armies of heroic and villainous “bug men,” who rode enormous insects into a never-ending battle for control of their alien world. 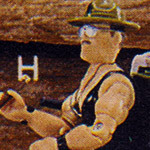 I’ve already written 40 trillion words about The Hyve, the most badass action figure playset this side of the U.S.S. Flagg. The reality is that every toy in the Sectaurs line was nearly that good. 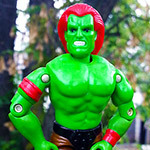 The “standard” action figures were anything but, towering over He-Man while having more articulation. Their battery-operated bugs-of-burden are some of the coolest toys I’ve ever had, essentially acting as souped-up hand puppets with whirring, flapping wings. Everything about the Sectaurs line was perfect, right down to its unforgettably episodic TV commercials. 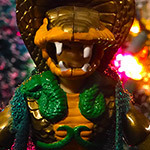 It’s almost never true when collectors say that they don’t make toys like they used to, but when you’re talking about a seven inch action figure riding an electronic dragonfly towards a three foot plastic castle… yeah, they really don’t make toys like they used to. I’m guessing that many of you had at least one of these. Sadly, my old Gobots sleeping bag isn’t pictured here. 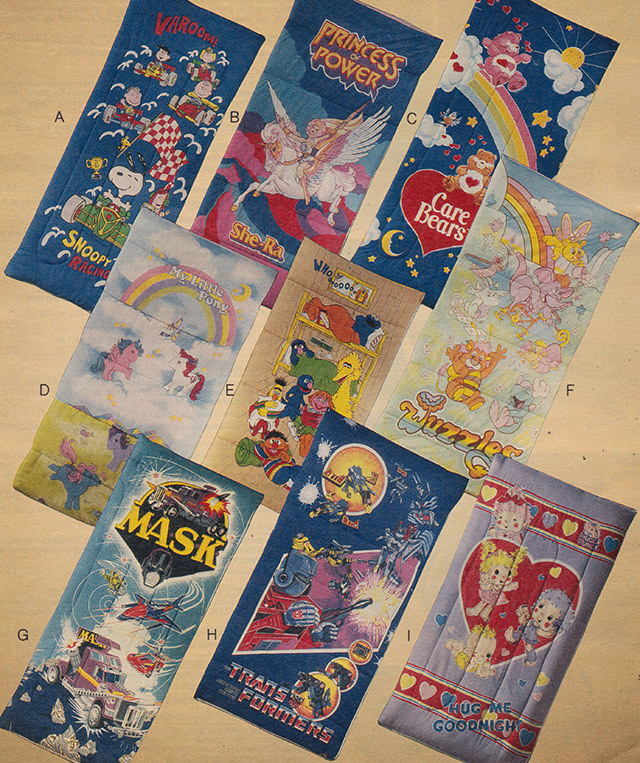 That sleeping bag is responsible for one of my earliest and saddest grade school memories. In kindergarten, we had a predesignated naptime. All of the students would gather in a separate classroom to sleep on the floor for an hour, in our own sleeping bags. One afternoon, I slept so heavily that the teacher couldn’t wake me without a level of shaking unsuitable for my tax-paid caretaker. So she called my mother in to handle that. Revived, I was so weirdly embarrassed by the incident that I refused to go back to class, and cried my way into getting the rest of the day off. To this day, I have no idea why I was so embarassed, or how I possibly slept so soundly that a teacher four times my size couldn’t wake me up. To this day, I have no idea why I had a Gobots sleeping bag instead of a Transformers one. The hell? Thanks for reading about old junk. I’m hoping to get one more post up before Christmas arrives, but since many of you won’t have time for me this week, I’ll say it early: Merry Christmas! Or, if you don’t celebrate it, Happy Few Days Off! Want to read another article like this? 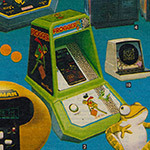 Come check out the highlights from the 1982 Sears Wish Book!